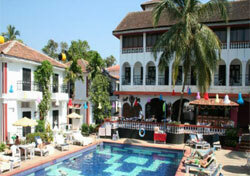 Every season is a reason to stay here … Located in Baga, Calangute, 500 mts. from the beach, the Ronil Beach Resort comes as a total surprise with its lively international atmosphere, gracious hospitality and a variety of both local and international menus. Re-discover the joys of a fun-filled holiday for the entire family in the comfort of 84 rooms, 4 deluxe suites, 2 restaurants, an air-conditioned coffee shop and two fresh-water swimming pools. All embraced in a friendly ambience, with even friendlier service. In other words, all the 5-star comforts at 3-star prices. And if all this wasn't enough, you can also take advantage of many attractive packages and incentives, all the year round. An air-conditioned coffee shop with pool table. 4 Luxury suites, 84 air-conditioned rooms, with satellite cable T.V., fridge, hot and cold water.